Brownies tend convert to gluten free recipes fairly easily, as opposed to baked goods that rely heavily on the gluten in wheat flour for their structure, like rustic baguettes. Although cakey brownies have their fans, most brownies should be fudgy and tender, with a little bit of chewy to them and these are all qualities that are very possible to replicate with gluten free flour blends. 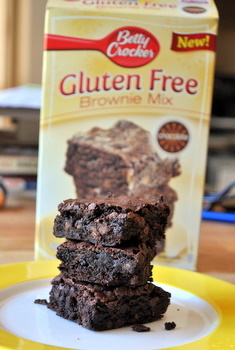 I’ve had great success with gluten free brownie mixes in the past (and have used Gluten free flour blends in my own regular brownies before), so I immediately picked up a box of Betty Crocker’s new Gluten Free Brownie Mix to try. The brownie mix has a great ingredient list of sugar, chocolate and a mixture of cocoa, rice flour, potato starch, corn starch, xanthan gum and salt that stands in where other recipes might have wheat flour (produced in a facility totally free from wheat). 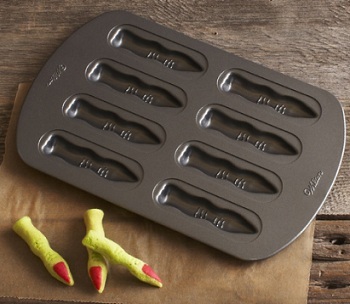 You add melted butter and eggs, pour the mix into a baking dish and you’re good to go. The brownies are excellent. 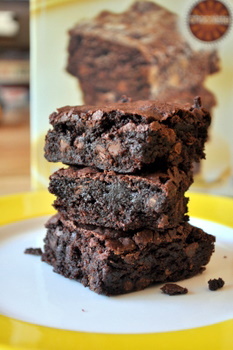 Although the photo on the box shows light colored brownies, these bake up to be dark and fudgy, with lots of chocolate flavor. There are even mini chocolate chips throughout the bars. Naturally, I passed these out to a bunch of tasters who assumed that I baked them from scratch and were all very surprised to learn that not only were they from a mix, but that they were gluten free. My verdict here is that these are darn good brownies – mix or not – and definitely a good option if you’re looking for a fast brownie fix – gluten free or not. Thanks for the review. I am always afraid to try new mixes like this. Looks like a winner! I just made these the other day too, and not only did my kids and I love them, but my mom, who is a brownie aficionado and very particular about her chocolate (and could care less about whether or not said product is gluten free), loved them and said they were one of the BEST brownies she had ever tasted. PS- I’ve also made the Betty Crocker Gluten Free white cake and chocolate chip cookies. The cake was “eh”- It will pass, it wasn’t gross. But the cookies were as awesome as the brownies. 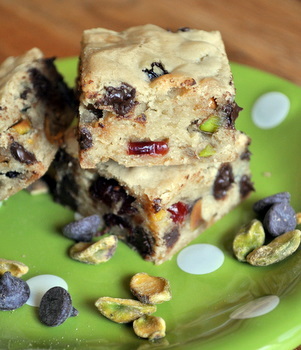 Not quite as good as Gluten Free Pantry’s chocolate chip cookie mix, but darn close.